Time and time again, it is women who, when confronted with the gut-wrenching challenges of our time—sexual harassment, racism, economic adversity, and more—find the strength to work relentlessly to move society to a better place. We create real, positive and transformational change through our actions, through our voices, and through our vote. When the powerful have tried to silence us, make us feel invisible, or belittle our causes, women’s voices have risen and taken a stand for justice. As we face one of the most critical moments in our nation’s history—and in YWCA’s 160-year history of action, service, and impact—it is women again who will lead the way. Every 90 seconds another American is sexually assaulted. One in four women will experience domestic violence and, on average, more than three women are murdered by their current or former partner every day. Gender-based violence occurs across all races, classes and ethnic backgrounds, though at disparate rates and with disproportionate impacts for women of color. YWCA stands with survivors in the midst of a national culture which still blames the survivors, upending the lives of women and girls all across our country. And now we see the added blame towards women who seek to provide dignity, respect, confidentiality, and choice to Dr. Christine Blasey Ford, whose report of being sexually assaulted by Judge Brett Kavanaugh—currently under consideration for a lifetime appointment to the U.S. Supreme Court—has gripped the halls of Congress and media headlines over this past week. To step forward as Dr. Blasey Ford has done is no easy thing—and YWCA applauds her strength in doing so. YWCA implores the Senate Judiciary Committee to act on a bipartisan basis to investigate her claims and utilize a process that prioritizes fairness and justice for survivors over political expediency. This past week has made so many things crystal clear. We are living in a moment that absolutely requires leaders who understand what it’s like in the real world, where survivors of sexual violence endure relentless attacks on their dignity and basic humanity just to be heard and believed. Where blocking court cases about sexual harassment, discrimination, or equal pay—as Judge Kavanaugh’s record indicates he would—means women can’t get justice. It also means our LGBTQ+ sisters and brothers, and women of color, can’t get justice. America, we can and must do better. Join us Monday at 1:00 p.m. ET. 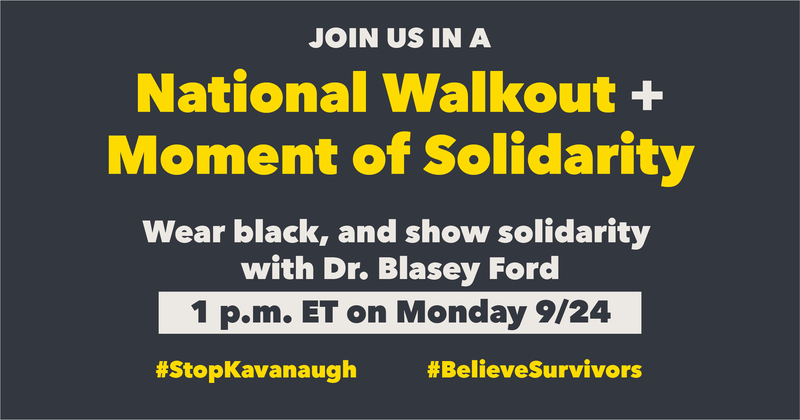 Wear black and stand with us in a moment of solidarity to support Dr. Blasey Ford and all survivors of sexual violence.